We will not be repeating the same clinched line about how mobile apps have revolutionized the world. We will be rather discussing why chatbots have become the need of the hour. Chatbots have grown exponentially. 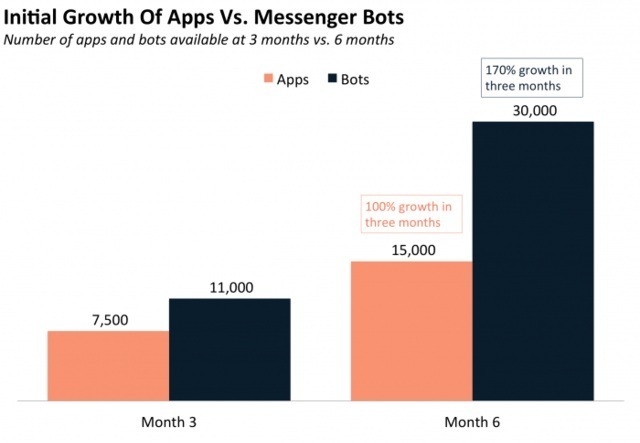 Chatbots docked to FB messenger increased from 30,000 in 2016 to over 100,000 today. Many big brands like American Express & H&M implemented chatbots and 60% of the youth uses them on a regular basis. You will be surprised to know that the popularity of the search term ‘chatbot’ in Google Trends has increased over the years. Chatbots are transforming the way business interact with the customers. The aforementioned stats prove that Chatbots have become the new gen-tech. 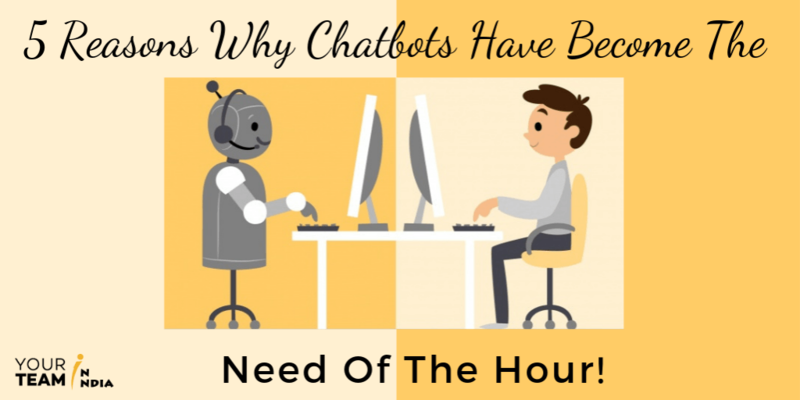 Now, no more waiting for the right time to make Chatbots a part of your business. Still not convinced why you should prefer chatbots to website or apps that can accomplish the same tasks. Here are the five reasons why you need to integrate chatbot to your mobile apps or website! Individuals use apps to do tasks at a quicker pace. Over the past decade, the marketplace has been flooded with plenty of apps. Mobile app developers have created apps for shopping, commuting, socializing, dating, music, and the list is quite long. It is always good to have different apps, but nowadays, people have started relying on old apps and not interested in downloading new ones. Today, there are apps for everything and anything. Before developing the app, ask yourself, who needs it? For example, if someone wants to book a flight, that person will first have to download the app and the book. Users don’t like to download the app every time they book a trip, purchase shoes or anything else. The problematic constant switching among different apps is very irritating. This is where chatbots shine. You never have to download them and they can resolve issues hassle-free. Improve customer engagement: Establishes personalized customer interaction giving them credible shopping experience as per their preferences and purchase history. Market funnel guidance: They don’t keep users waiting as they guide them through every aspect of the same while addressing different queries. Relevant notifications: They smartly predict the customer’s behavior and push the appropriate notification to the right people all the time. Broadened reach: They reach out to innumerable prospects with the help of social media or other platforms. Enhances brand value: They grab customer’s attention and then communicate the brand to the target audience in the best way possible. As per Statista, there are approximately 2 million iOS apps and same is for Android till December 2018. With these stats, it becomes challenging for a new app to reach a wide range of users. Apps are not websites so it is important for business owners that they should update it at regular intervals. It is better not to compete with the apps because you can choose the easier way by switching to chatbots. Everyone loves exploring technology. Do you know approx 44% of US consumers prefer chatbots over humans for customer communication? If you really want to be successful, ensure that your chatbots are bug-free, aligned to the brand, provide linguistics and that works effortlessly on multiple platforms. All this makes customers happy and satisfied. Do you know that every year approximately 265 billion customer support requests are made and this straightforwardly costs businesses $1.3 trillion to service them? Yes, this is true as per the 2018 report of Chatbots Magazine as they help business save up to 30%. What will you do when there are 100 people messaging you at the same time and everyone has a different question? Hire customer support people? It is better to build a chatbot instead. Configure the chatbot in a way that it understands what the user is asking and answer the same intelligently. Bots also can scale your brand more than apps or websites. 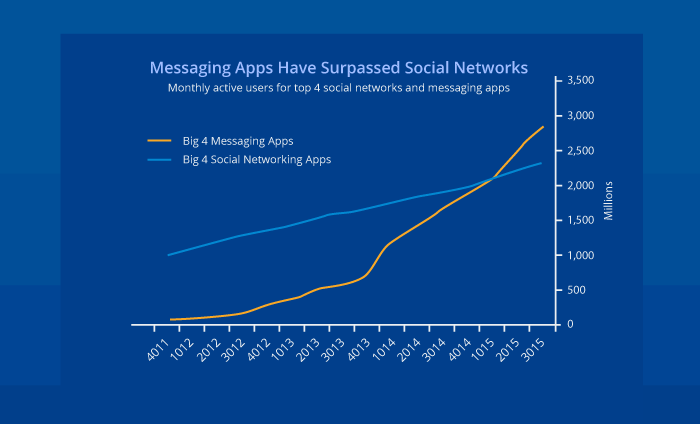 Here is a chart from BI Intelligence depicting that chatbots have taken over social networking apps in the number of monthly active users. All bot feature updates can be done with the continuous integration to the backend. To ease the buying process, your chatbot should pop up on any product page so that additional information or discount code is displayed. E-commerce chatbots help you buy products, food chatbots can order meals and trading chatbots deal with finances, content chatbots offer content you find interesting and the list goes on and on. Streamline your business operations for the better to improve marketing and sales. Chatbots promote sales by keeping customers updated about products or services. Posting on websites or FB wall won’t raise that much engagement compared to a mail sent to the clients. Chatbot gathers information from the customers and personalizes their responses. They help users choose the products, process payment data, enter a shipping address and complete the order. Creating a chatbot that succeeds comes down to one thing: Planning. Figure out what you want your bot to be good at. Will that helps customers to navigate the inventory? Tap into the potential of chatbot and transform your business. Business is all about reaching the relevant audience! Chatbots are predicted to deal with approximately 90% of the customer inquiries in the upcoming 5 years. By 2022, it is expected to cut the business cost by $8 billion. Sam Mandel, CEO of a company that develops a weather forecasting chatbot – Poncho, predicts that in the future, we will not just be limited to asking for information on if it is going to rain or be sunny. He quotes, “Our goal is to make it the first bot you want to be friends with.” He adds that if you insult Poncho in the future, he would refrain from answering for a while. Finally, chatbots are expected to contribute an integral share of the consumer and business software ecosystem. Be ready to embrace and integrate chatbots.